We have as much to learn from 2001: A Space Odyssey as we do to wonder. These workshops allow us to explore the broad themes and tiny details of all aspects of this film, the year it was made, and it's lasting impact. "To the young mind everything is individual, stands by itself. By and by it finds how to join two things and see in them one nature; then three, then three thousand; and so, tyrannized over by its own unifying instinct, it goes on tying things together, diminishing anomalies, discovering roots running under the ground whereby contrary and remote things cohere and flower out from one stem." 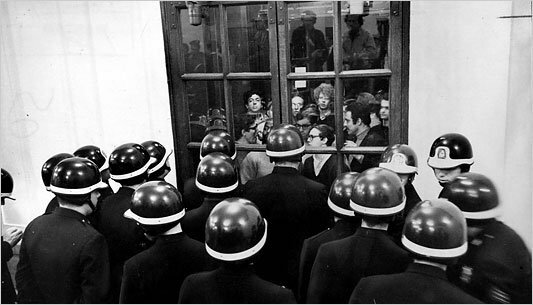 During the week of April 23- 30, 1968, over 1,000 Columbia students locked themselves inside administrative buildings on the Columbia campus in protest of the Vietnam War and Civil Rights violations happening in their neighborhood. This historic demonstration by American youth sparked many more protests throughout the year. Fifty years later, we see the students of Parkland reactivate the power of the youth voice. In honor of this anniversary, we have created a small class activity to be used by all ages. Follow the button to start your discussion on activism and the lock in of Columbia in 1968.